Good news for those who added velvet pieces to their wardrobe last season or in case you missed it last fall, the look is back (and better!) for another year. Velvet continues to permeate the wardrobes of A-listers, from Kendall to Amy Adams and it is a particularly hot fabric for red-carpet affairs throughout the colder months. I personally love the trend on a blazer jacket, as it is truly the easiest way to wear the trend, plus it allows for layering which is absolutely necessary given the weather lately (woke up to one degree Celsius today, say what?!). 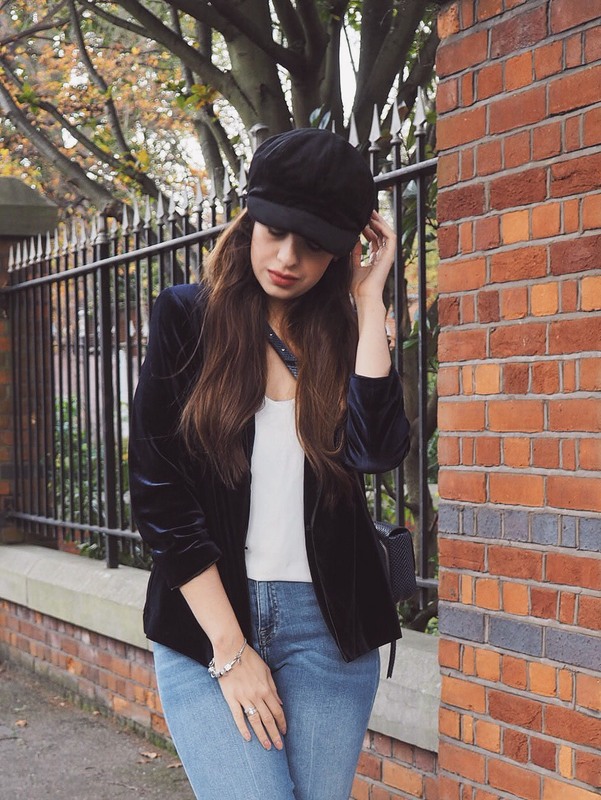 Here's how to style a velvet blazer this season, no matter what the occasion may be! 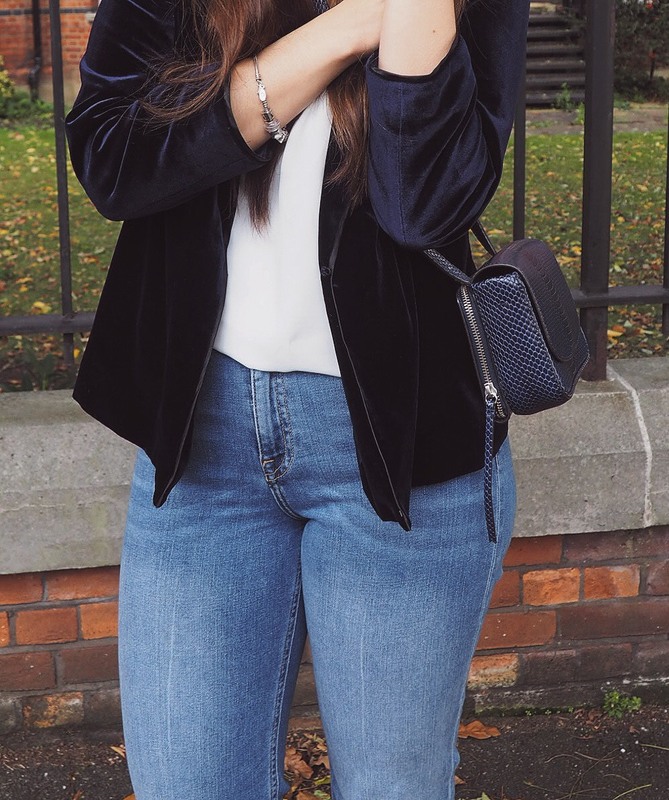 CASUAL: Try boxy, oversized and masculine shaped velvet blazers for a more laid-back take on the trend. 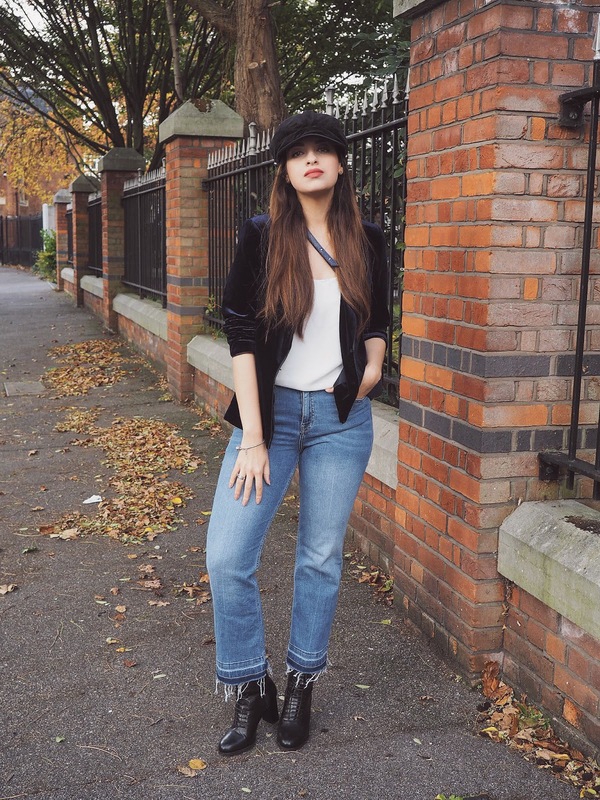 A paperboy hat makes for the perfect accessory. PARTY-READY: Fitted velvet blazer styles work better for such occasion and it looks great under a strappy LBD or a pleated skirt. Opt also for bold colours as coloured velvet was very coveted during NYFW earlier in the season. DAY EDIT: Do it like me, add a white tee or cami and pair it with light-wash denim. Finish the look with boots or white trainers. NIGHT EDIT: Swap the white cami for a lacy black one, pair it with black pants or a darker wash of denim and top it all off with coloured heels! And if a blazer is not really your thing, velvet is everywhere and in a variety of different garments. 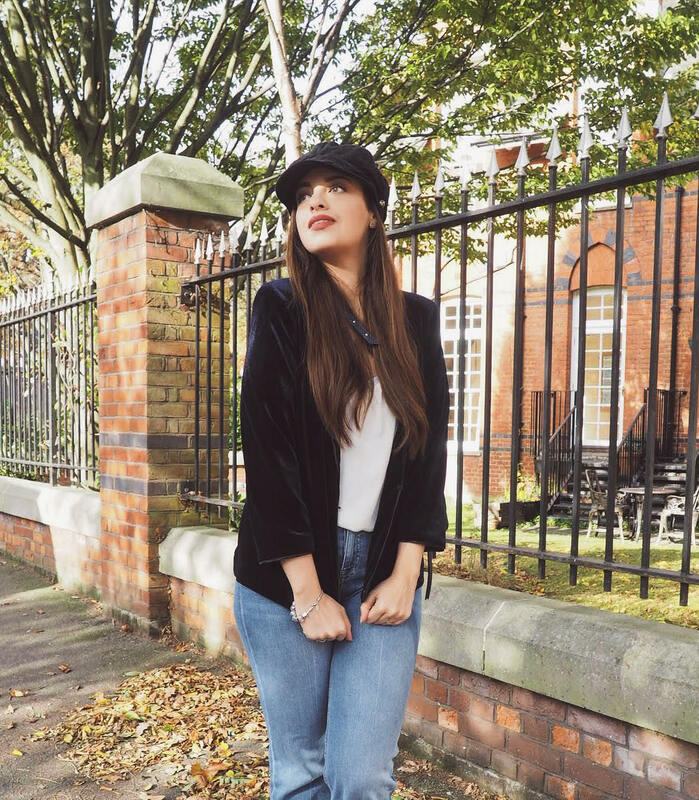 From boots to tops and even pants, velvet is fun, soft and looks super luxe how matter how you style it. Needless to say, it is one of my favourites to try this season, and if you give it a try I'm sure it will be yours too. Thoughts on this look? Let me know below! Here's to a brand new week ahead beauties! Looks great, love it paired with the boots! Beautiful blazer! I like combination with that hat and jeans! That outfit is so adorable!! I love the blazer. Amazing post dear! I really love our outfit! I still don't own anything velvet, yes I know it's a huge trend but I think it's a trend that will die down in a year or two and these days I'm looking to invest in timeless pieces. oh, that's so cute! i love how it reflects light off certain folds - definitely gives it more of a perk than a regular old black blazer! 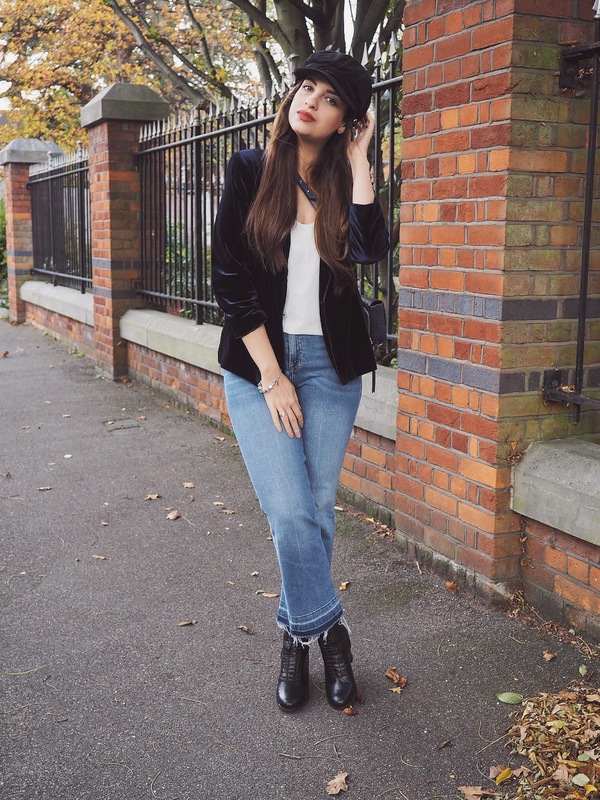 I always liked velvet, this velvet blazer is gorgeous, loved how you paired it with denim and black boots. I loved your outfit, dear Pam! You look so beautiful! I love velvet and I loved your blazer and the boots are amazing too! I hope you have a lovely week! thank you, have a good week too! Novo horário, de 2ª a 6ª às 19h, post novo! thank you! I am obsessed with these jeans! Great outfit, as usual! I had a velvet blazer in high-school, used to wear it all the time. After I gained a lot of weight I stayed away from this material, as it made me look bigger, but now I`m ready to embrace the trend again. I'm sure you will look great in it! YAY! Thanks so much Carmen! I really love this look. I've never considered getting velvet anything, but you are slowly converting me. Do it girl, you won't regret it! thanks Elena! Glad to see you around here! Such a pretty casual dress dear! Love the velvet jacket, and those boots are really fabulous!